Mechanical presses are famous for their high production rates and part making accuracy. Fingertip programmable computer control of press functions is provided by the Press Control Center designed and built by CINCINNATI. The combination of Menu Driven Software and Softkey Technology simplify set-up and operation to reduce operator effort and ensure proper production of repeat production lots. 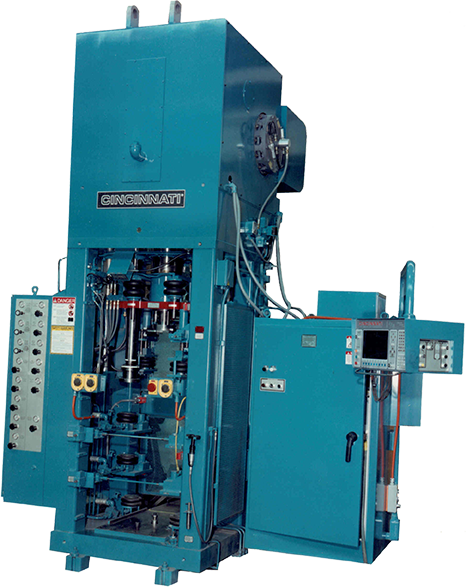 Mechanical presses are famous for their high production rates and part making accuracy. The all steel welded construction uses a tie rod design to provide a rigid robust press structure required for precision part production. An AC Variable Frequency main drive motor provides power to double reduction gearing contained in a fully enclosed crown located above the die area to keep powder out of critical drive mechanisms. All drive mechanisms are lubricated through a double filtered pressurized recirculation oil system to ensure long reliable service under demanding conditions. Withdrawal press motion permits start of the fill function earlier in the press cycle than other types of press motion. It also reduces potential for air entrapment and causes the least disruption of the powder during entry into the die cavity. This optimizes the press cycle and helps ensure production of high quality consistent parts. The press frame is designed to accept a removable Die Set. A unique air caster system moves die sets between the press and a Simulator that is used to facilitate tooling installation outside the press. This minimizes part-to-part changeover times by allowing timely tool changes to be performed off-line while the press continues to produce parts using a second die set. The press frame can be configured to accept die sets with 1, 2 or 3 moving platens to provide for maximum system versatility. Absolute guiding is achieved for Top Punch Plate and Die Platen through the use of common guiding. With absolute platen alignment, tooling lasts longer, maintenance is minimized and higher quality precision parts can be produced. CINCINNATI has been the leader in development of programmable controlled powder feeder systems. Operators have complete control over all critical powder feed shoe motions though the Press Control Center combined with an AC servo motor driven ball screw feeder drive. Good parts begin with consistent filling of the die cavity. The Parts Maker Programmable Feeder combination allows optimized part quality at the high production rates needed to be competitive now and in the future. CINCINNATI provides an extensive list of comprehensive support services with each new press to ensure many years of productive profitable service.